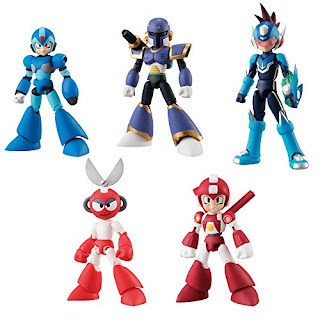 The new figures include Vile, Star Force Mega Man, Cut Man, Super Mega Man, X's Ride Armor and Vile's Ride Armor. 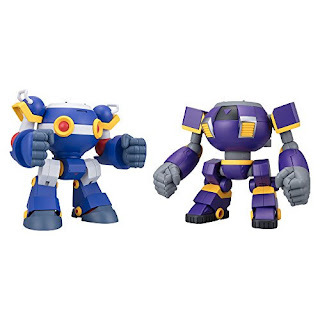 The X figure isn't exactly new – it was included in the initial 66 Action line from 2016 – but the face looks a little different. Pre-orders should go live soon. Thanks to Reploid21XX for the heads up! This answers my question regarding X's one arm not being visible in the ride armor while displayed at toy shows; his "extra" accessory is his left arm, which we didn't get with the last batch. I'm a little disappointed that this configuration makes it seem like we're not getting a rare, one-per-box-of-10 variant like the last batch, as 5 separate designs suggests that each large retail box will contain two of each character. Oh well. I'm excited for these anyway; the sculpts were great for the price on the last batch, and the price for the amount of figures (even pre-ordered at an inflated price) was worth it to me. The ride armors looks great, and I love this tiny scale! Here's hoping this isn't the last wave! $54 for the figure pack, $60 for the Ride Armor two-pack. Still, pretty great prices. About average if you were to buy the figures individually. I really wish someone would put out other figures instead of re-releasing the same characters under different brands/companies over and over. Who do I have to sleep with to get ANYONE ELSE but X, Zero, and Rock? I'll join in if it'll get us some ZX stuff. Literally need/want the animal based Mavericks from the X series! Every maverick sculpt would have to be different; we keep seeing iterations of the same characters because they use mostly the same body type. Example: Cutman, which is basically just Mega Man with a different head. Those are the most popular, and will be the default for every series. they only way to get uncommon characters is through the blind boxes, because then a lot of people are forced to get unpopular characters while trying to get popular ones. 66 just sounds bad luck. That said what's up with the Ryuusei love? It's weird. Now, if they promised something like "44 Action," that might be different. pretty neat stuffs. good to see Vile getting something. why is vile associated with a cup of whiskey? i think D-art also this too. It refers to a scene in Iwamoto's Rockman X manga. Vile says something edgy about Reploids not knowing the difference between bourbon and mud. Then he smashes the glass. It's because in Rockman X(1) manga there's a little scene where Vile and X are in an western style pub, and Vile's sitting there drinking bourbon. The japanese fan base kept on using the idea, much like how Bit's MERRY CHRISTMAS is another tradition from the same manga author. Neat, since I bought X on a whim last year I'll snag Vile and the armours for some fun. These just popped-up at BBTS for pre-order. September... seems so far away. I want these bad. I need X and Vile with both ride armors. So because they are random boxes, should i wait until they appear in Ebay with the corresponding figures? They are not random. The boxes show the character you get, and there are no chase figures in this set either. It should be pretty cheap just buying the RA set and track down Vile and X later.